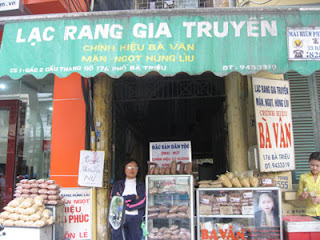 A simple glass cabinet, a modest signs, kiosk of Van’s flavouring powder roasted peanuts still has many years presence in 176 Ba Trieu street, next to the household art to lively customers go to shopping, order. Can say this is the heart of those who just love the popular gift . Have the opportunity to chat with facilities, including shop owners this year, we know communication profession flavouring powder roasted peanuts by Chinese share for her husband before returning to the country. From the mid 60th century before she roasted peanuts taken canteen in the office. Initially only a few three-weight, gradually, canteens of other offices also begged her roasted peanuts. That day, she court to coast peanut making more money to cover salary for life outside the tight. Later when she had reputable, people order especially on the holidays. Than 40 years now, she’s always been the consistent love, trust of customers. This year, Ms. Van has 81 year old, but still agile look, quintessense. In the cold of Hanoi’s winter. Her smile is radiant, sometimes pinky cheeks, hidden in her dark beauty containing ardent of daughter Ha Thanh ancient. 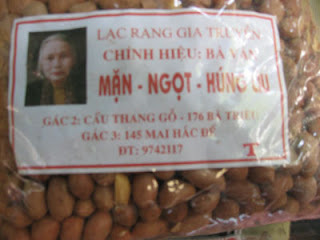 She confided to us: “To do the this job to know the selected peanuts, this is the most important factor. Be soaked, drenched, dried so that all communications, not too salty, not too sweet. Must be dried by wood, so that really clean sand, sand to get yellow white. When roast put low fire that peanuts overdone . Be careful when roast, have to be very gentle as do not cover. If the substance to the fire communications will be cracked, the sand will be in peanuts ; touch the fire out but still raw. Customer will not consent to eat. Said the flavouring powder, this is the important factor to locate the taste, can salty, sweet or salty sweet mix. Three taste helps customers most difficult communication can also find flavouring powder roasted peanuts suitable their taste. With Mrs.Van ‘s kiosk , ” flavouring powder own family to take, if purchased outside the vulnerable people mixing sawdust will not specific odor and not for long. With the fresh eye as she pleased: “For ten years I tried to transfer the job to his son is Nghiem Minh Tuan and grandson is Nghiem Minh Tung, are the children I love this job. Keep the job he did in the effort to learn, communication for me, I’m very happy …. She always advised his children to certain “Do the right formula, creating features for their products they can retain customers long term. Results so, along the old Ba Trieu street almost become “flavouring powder roasted peanuts street”. Many kiosk have found signs letter from Van: miss Van , Van fat, old Mrs. Van, real Van … but her name with patrons, gourmets will not be mistaken. In the cold winter wind, sitting in the tea shop of the road, when that warm hands on the hot cup of tea, enjoy a sweet taste, dust, aromatic of flavouring powder roasted peanuts … Then you get home to the chat … laughing wine … dispel bitting cold. Gifts of Hanoi capital city and the simple and unstudied, but it seems to have become miss of Hanoi people when they leave. Just as we sometimes nostalgic concept, unfortunately the memory of this childhood dish snacks no longer. Furthermore, keeping the features of each domain, each local government also began to keep the culinary pleasures simple but is very individual.